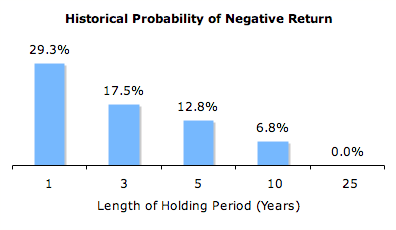 [Guest post by Mike Piper] Conventional investing wisdom states that the risk of holding stocks decreases as the length of the holding period increases. But is that true? [Guest post by Tom Warburton] Last week a buddy walked into my office distressed over unemployment, the economic malaise, gold prices, the prospect of inflation, government debt, currency fluctuations, trade imbalance and future prospects for the stock market. He basically covered the waterfront of issues we see on the front page of financial magazines and issues we hear talked about on CNBC. When my buddy left my office (somewhat soothed – I believe – in the knowledge that his portfolio was positioned to achieve his financial goals without regard to the speculations of Jim Cramer), I found myself thinking about the many obstacles that humans have overcome and the unlikelihood that ‘conditions will last’. Is China a big bubble? What a difference eighteen years have made. Then there was no private ownership of automobiles; now China boasts the world’s largest car market. Then there was no private ownership of houses; now there is little public housing left. Then China had a grand total of 28 kilometers (17 miles) of expressway; now China’s expressway network is second only to the U.S.
Then there was no high-speed train service to speak of; now China has the fastest high-speed train service in the world covering the equivalent distance of New York to Chicago in three hours. Then China’s economy was the 13th largest; now it is the second largest.